This project has been running for five years in that time we have written a customised database system. The system holds data such as girth and height, digital photograph and the position of each tree is marked on an aerial photograph. To date we have recorded 932 trees on 177 sites. 42 People have recorded trees. We have held numerous courses to show interested people how to record the trees. 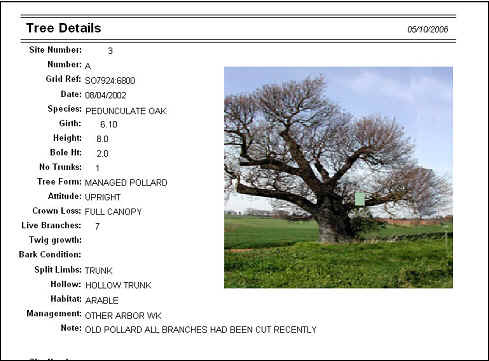 We have also involved the Parish Tree Wardens and asked them to record ancient trees in their area. We are now applying for funding to help with this project as it gathers impetus. The Distribution of the recorded trees in Worcestershire is shown below. 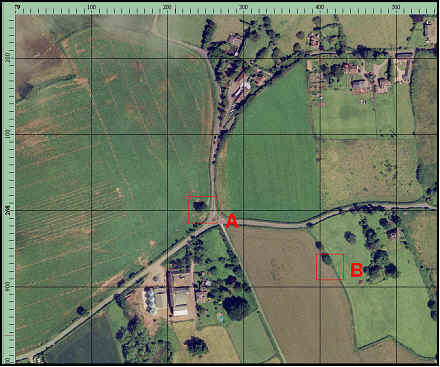 An example of a tree report and the aerial photograph is shown below. If you would like to get involved with Ancient Tree recording please contact either Harry Green or John Tilt. Details of trees recorded in the Worcestershire Register. Distribution of ancient trees recorded in the Worcestershire Register in 10 km squares of national grid.